A copy of an antique snuff box. 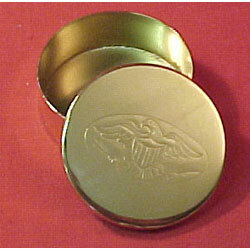 Round box, 2-1/2" diameter, 1" high. Lid presses in place. Very well made and quite attractive. American eagle design impressed on lid. From Ted Cash Mfg. Available in brass No. 77471 or German silver No. 77472.